Steam is traditionally used as a natural way to help ease congestion year-round. It works on congestion due to allergies, respiratory problems, cold, and flu. The best steam inhaler should be a quick and effective way to experience relief from these common problems, and they’re easy to maintain. They run off of batteries or via electricity, and you add water to the small reservoir. Once you switch it on, it’ll convert the water into steam and direct it to your problem areas. There are dozens of brands available to choose from, and they all offer the same relief. But, how do you decide which one is best for your situation? Our buying guide gives you the important things you want to keep in mind, and our ten best steam inhaler reviews give you a way to quickly and easily compare the various models and make an informed decision. In order for you to find the best steam inhaler to suit your needs, you have to keep the following things in mind. 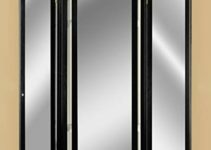 Some devices feature a dual chamber, and this chamber is designed to hold water in one side and essential oils in the other side. If you routinely use essential oils, it may be a good idea to find a steam inhaler that you can put your essential oils in and use them to help open up your sinuses. Your steam inhaler should be fairly straightforward and easy to use. A lot of these devices feature a simple on/off button, an adjustable steam control, and a timer so you can adjust your session length. If you have mainly sinus problems, choose a steam inhaler that is specifically designed to help with this. 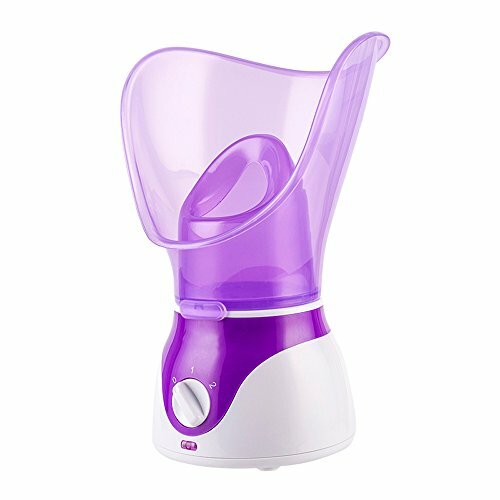 If you want to have one with a dual purpose, some can work to clear your congestion, and they can also work as a facial steamer. It’s important to note that the facial steamers usually don’t generate enough steam for deep-set congestion or sinus problems, so it’s important to keep this in mind. A lot of these devices are made out of plastic, but you can find devices with aluminum bases as well. The aluminum is more durable, but you’ll typically pay more for them. If you can find a device with hospital-grade materials, this will be a safer and more durable option. 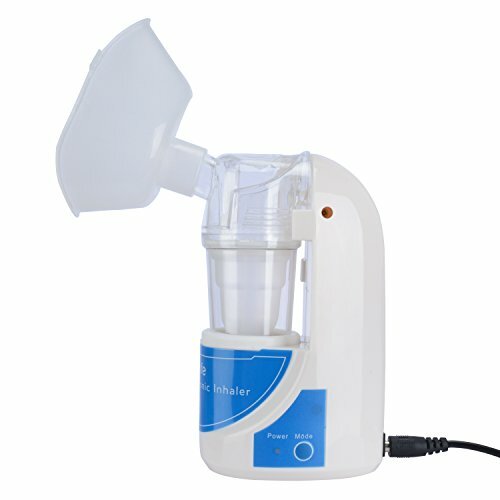 A basic steam inhaler device can cost around $30, and this is low enough for most budgets. But, if you start looking at the more high-end models, they can easily run upwards of $200 per device. Your budget will play a role in what type of device you end of choosing. Because you’re using hot steam and hot water, you want to stay safe when you use it. An automatic shutoff timer is a good feature to have because it can ensure that it doesn’t run dry. Also, some come with temperature controls, so your steam doesn’t get too hot and burn you when you use it. The size of your device is another important consideration if you plan to travel with it or if you have limited storage space. As a general rule, most of these devices have a compact design. However, some are more flat while others stand upright. These can be more difficult to store. Most of these inhalers funnel their steam into a mouthpiece that opens up into a mask. But, you want to make sure that whatever steam inhaler you pick comes with enough power to produce the steam you need. Some only produce very small amounts, and this may not be enough to help you. This compact device works to alleviate the symptoms of colds, bronchitis, flu, and a variety of other respiratory problems. It generates soothing steam that penetrates your nasal, throat, and sinus passages quickly and naturally for all-day relief. The soft plastic hood is comfortable to use. You can set it to provide steam for five to 15-minute treatments, and you can adjust how much steam is released during this time. It’ll automatically shut off when the steam runs out, and the compact design makes it perfect for travel. It runs on 120-volts, and you get a one-year warranty. 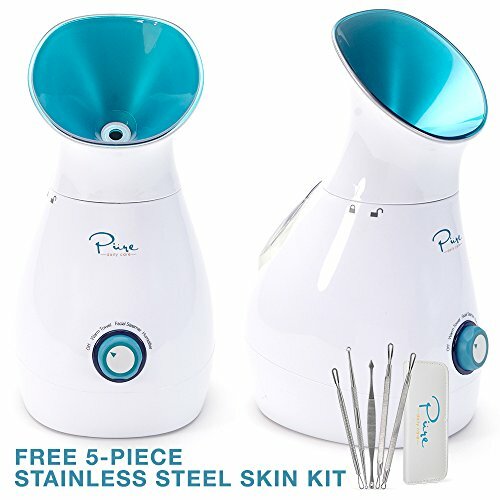 This steamer is designed to work on your entire face, and it delivers nano-iconic steam. When you combine them with water, they’re 10 times more effective when it comes to penetrating your skin. You also get a bonus five piece skin care kit included with the steamer. This three in one device allows you to add humidity to a room or warm towels as well as helping to clean out your nasal passages and sinuses. It comes with a larger water tank that can hold 200 mL of water, and it can run for a maximum of 30 minutes per tank. This steam inhaler provides quick relief from congestion or cough that can be caused by colds, allergies, and sinus issues including chronic sinusitis. The steam is 99.99 percent free of germs, and targets your nasal passages and your throat for soothing relief. You’ll get adjustable steam control and an auto-off feature that safely stops the inhaler when it runs out of water. You can use tap water, and it doesn’t require the use of any filtration system. You can also add one or two Vicks VapoPads for a soothing menthol scent. This personal steam inhaler is made out of plastic, and it doubles as an aromatherapy device. You get filter free steam control that you can adjust quickly and easily, and you can add your favorite essential oils for a burst of aromatherapy. This setup comes with a soft, flexible mask, a flexible extension tube, aromatherapy tank, drain tank, indicator light, measuring cup, and five-foot power cord. The tanks have a clear front so you can easily see how much water remains in the tank. It also comes with a one-year limited warranty against defects. 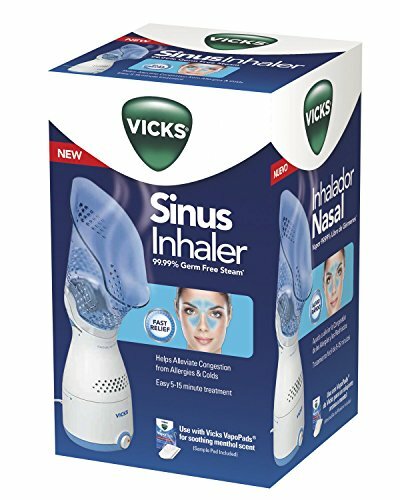 This steam inhaler produces a very fine mist that quickly makes its way deep into your sinus cavities for maximum relief. This setup is handheld and portable so you can take it with you without a problem. The large on/off switch is very easy to use. The soft and flexible mask uses hospital-grade technology to deliver clean steam to your problem areas. It provides fast natural relief against congestion, chronic sinus problems, allergies, and scratchy throat. 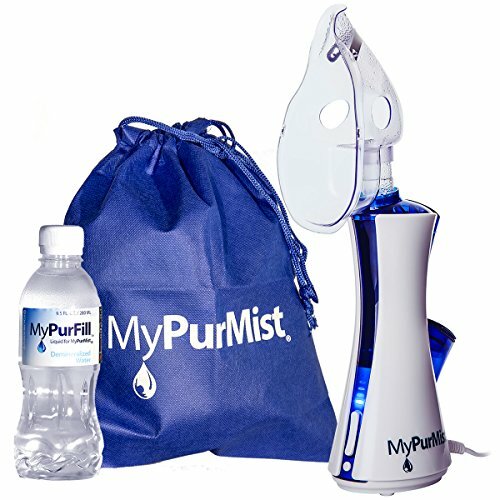 The MyPurMist Steam Inhaler produces 99.99 percent germ-free steam; it comes in a convenient bag for storage and transport. This device comes with an atomizing transducer mesh that helps to purify and clean the steam before it reaches you. It’s designed to run very quietly, and it uses cool mist instead of hot steam for a safer and family-friendly option. You can select from a 5 to 15-minute treatment, and the device automatically shuts off once the time limit is reached. This is a very compact device that makes it easy to store and travel with, and you get a one-year limited warranty. Also, the mask is made out of very soft and flexible plastic. 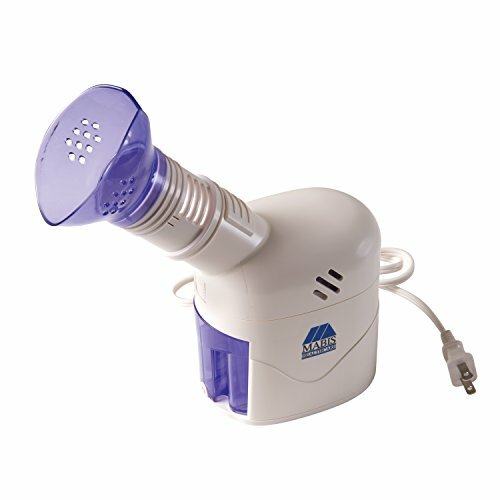 The steam inhaler works as both a steamer or a facial sauna. You can use it on several skin types, and it releases a warm mist that works to clear up your sinuses quickly and easily. You can use this device every day as part of your routine. It also comes with several built-in safety features including an automatic shut-off, thermostatically controlled temperature regulator, and a switch to prevent it from overheating. This means that you don’t have to worry about the steam getting too hot and burning when you use it. The vapor pot is made out of durable aluminum. This compressor kit comes with the steam compressor, an adult and kit mask, air tubing, nebulizer, mouth piece, and five filtration pieces. It has an easy carry handle so you can move it around as you need to, and it runs on 120-volts. It weighs just over three pounds, and it is a very compact kit so you can store it easily. The masks are very comfortable, and they form a good seal over your nose and mouth so the steam can open up your sinus passages easily. It releases very warm steam as well. This device is designed to be smaller for kids to use, and it is very easy to use. It has an automatic shut-off timer that shuts the device off after 10 minutes. It also comes with a sleep lamp and music so it can double as a soother. This device has rechargeable batteries, and these batteries can work for up to seven treatments. It has particle filtration, and this makes it release a cleaner steam every time your child uses it. It’s designed to have a softer casing, so it’s comfortable to hold, and it’s very lightweight. You’ll get two different masks with this steam inhaler, and you can choose from a large or a small mask. It has adjustable steam control, so you can easily adjust the amount of steam you receive in a treatment. The front of the device contains a clear water tank, and this allows you to quickly and easily monitor the water levels. 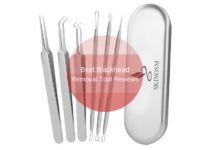 It runs between six to nine minutes per treatment, and it is very easy to clean. The steam works to alleviate common allergy, respiratory, and sickness congestion and symptoms. 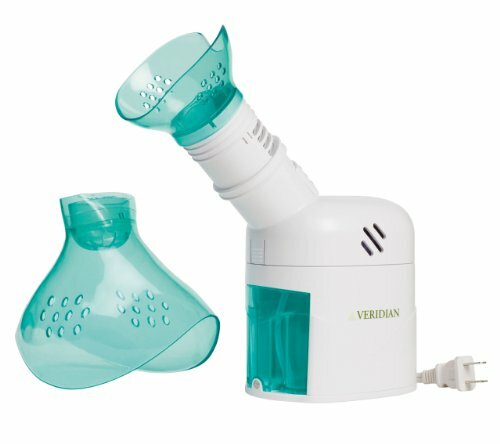 A steam inhaler can be a great tool for anyone who suffers from year-round respiratory issues. It uses a gentle steam to open up your sinuses and your respiratory tract so you can breathe easier. We hope our buying guide for the best steam inhaler laid out important considerations to focus on, and our comprehensive reviews gave you several steam inhalers to pick from.